Today we have finished filming in the green screen studio. 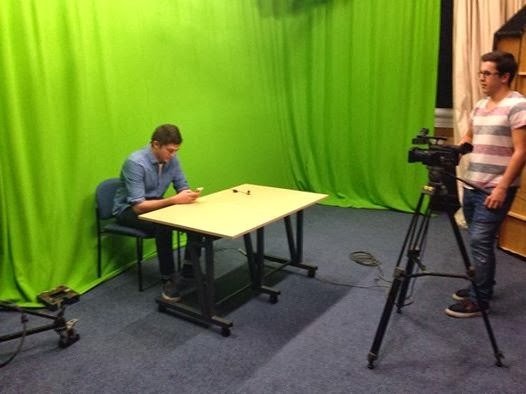 We have been using this facility due to the fact that using the green screen capability would allow us to create the illusion of a news studio very easily within the videos. The green screen capability would also allow aid in making some of the effects that will be in the videos, such as the time lapse and the portal effect. While filming in the green screen room we did not really encounter any technical issues with the filming. However the filming did take longer than what was previously expected. This was down purely to the fact that we were not using actors. In hind sight it would have probably been wise to have used actors within the videos because even student actors, would have some degree of professionalism which would have meant that the filming could have gone quicker, due to the fact that filming was going slowly due to the fact that we in the videos and because most of us were nervous in front of the camera meant that the filming went slower. We have also encountered another problem, which is not one that we could control. The problem in question is the weather. We were due to film outside tomorrow however looking at the weather report, that will not be possible. This means that filming will have to be put back another day when the weather is fine, but that means that the editors have one less day to edit the videos, which puts pressure on them.